Patients who are bedridden often suffer from muscular atrophy due to reduced daily activities and can become depressed. However, patients who undergo physical therapy sometimes demonstrate positive benefits including a reduction of stressful and depressed behavior. Regenerative medicine has seen improvements in two stem cell-based therapies for central nervous system disorders. One therapy is through the transfer of exogenous stem cells. The other therapy is a more natural method and focuses on the increasing endogenous neurogenesis and restoring the neurological impairments. This study overviews how immobilization-induced disuse atrophy affects neurogenesis in rats, specifically hypothesizing that immobilization diminishes circulating trophic factor levels, like vascular endothelial growth factors or brain-derived neurotrophic factor, which in turn limits neurogenesis. This hypothesis requires the classification of the stem cell microenvironment by probing growth factors in addition to other stress-related proteins that correlate with exercise-induced neurogenesis. There is research examining the effects of increased exercise on neurogenesis while limiting exercise, which better demonstrates the pathological states of immobile stroke patients, remains relatively unexplored. To examine the effects of immobilization on neurogenesis quantitative measurements of movements, 5-bromo-2deoxyuridine labeling of proliferative cells, biochemical assays of serum, cerebrospinal fluid and neurological levels of trophic factors, growth factors, and stress-related proteins will indicate levels of neurogenesis. In further research, studies are needed to show how in vivo stimulation, or lack thereof, affects stem cell microenvironments to advance treatment procedures for strengthening neurogenesis in bedridden patients. This paper is a review article. Referred literature in this paper has been listed in the references section. The datasets supporting the conclusions of this article are available online by searching various databases, including PubMed. Some original points in this article come from the laboratory practice in our research center and the authors' experiences. We hypothesize that limiting exercise affects the neurogenic function of the brain by altering the stem cell microenvironment. Previously, it was assumed that the adult brain possessed no regenerative abilities. However, there is increasing evidence showing the regenerative capabilities to produces neurons and astrocytes through isolated cells of the adult central nervous system (CNS). Numerous studies have tested the effectiveness of stem-cell therapy for treating CNS disorders such as stroke, traumatic brain injury, Parkinson's disease, and Alzheimer's disease but only as an experimental treatment. Many continue to be affected by these neurological diseases, especially many bedridden patients who suffer from muscular atrophy and depression due to significantly reduced daily activity. There is evidence supporting that patients who receive physical rehabilitation sometimes demonstrate surprising progress, specifically showing reduced signs of stress and depression. Despite this evidence, there is little research available on the effects of immobilization on neurogenesis. The focus of treating brain disorders through regenerative medicine has made advancements in stem-cell therapy through transplanting exogenous stem cells and strengthening endogenous stem cells through neurogenesis.,,,,,,,,,,, This specific research project concentrates on amplifying exogenous stem cells to naturally repair injured brain tissue and neurological impairments through physical therapy. The effect of the lack of exercise on neurogenesis has not been explored thoroughly, and we consider how exercise-induced disuse atrophy affects neurogenesis in adult rats by utilizing the hindlimb suspension (HS) model. Despite this, the opposite paradigm of our model has significant evidence showing that increased exercise enhances neurogenesis. Specifically, exercise enhances neurogenesis in the dentate gyrus (DG) of the hippocampus.,, In addition, in cases of other diseased states like cerebral ischemia, exercise has also proven to improve neurogenesis. With consideration of these previous studies, our thesis states that inhibiting exercise decreases neurogenesis possibly by decreasing circulating factors such as vascular endothelial growth factor (VEGF) and brain-derived neurotrophic factor (BDNF). Future laboratory studies are needed to investigate the biological mechanisms behind neurogenesis. A greater understanding of these mechanisms would allow for better treatment strategies to increase neurogenesis in immobile patients. The HS model to limit exercise was first used to explore the spaceflight-associated phenomena, focusing mostly on the data which showed inhibition of bone formation during spaceflight. In addition to the bone formation studies, several variations of this model have been used for research on muscles and the vascular network of hindlimbs. The primary focus so far has been on the peripheral effects of HS.,, However, there is limited research on the effect of the HS model on the CNS, with most previous studies focusing on depression., In 2005, Dupont et al. established that nerve growth factor (NGF), BDNF messenger RNA (mRNA), and NGF protein were upregulated in the somatosensory cortex in HS model animals. This evidence supports our hypothesis that the lack of exercise would affect neurotrophic factor expressions. While there are no current studies of the HS model relating to CNS disorders, there are forelimb disuse and overuse models for stroke and Parkinson's studies.,,, Schallert's group demonstrated that forelimb disuse (using one-sleeved casts), but not overuse, during the early phase of stroke recovery rats negatively affected limb functionality. However, in somatosensory cortical lesions, overuse of the impaired forelimb during early stage recovery also worsened the functional outcome. These contradictory results of forelimb disuse and overuse were deemed situational due to site-specific anatomical changes (e.g., subcortical in stroke vs. cortical in somatosensory lesion model). From this, subcortical damage likely benefits from the forced use of the impaired forelimb. Notably, usage of the affected forelimb after unilateral 6-hydroxydopamine (6-OHDA) lesions in rats reduced behavior deficiencies. In addition, forced forelimb usage before the 6-OHDA lesion reduced behavioral deficits led to an upregulation of glial cell-derived neurotrophic factor levels. The improvement of behavioral deficits in stroke and Parkinson's disease animal models were associated with sparing of ischemia and lesion-induced neuroanatomical and neurochemical deficits.,,,,,, From this research, the benefit of use or disuse therapy in CNS disorders and the justification for studying physical therapy's effects on the CNS using the HS model is clearly established. Gage et al's. studies focused on exercised-induced neurogenesis, linked free access to exercise (running wheel) for 3 h during the nocturnal period (active phase of rats) greatly increased 5-bromo-2deoxyuridine (BrdU)-labeled novel cells in the subgranular zone. Enhanced memory function correlated with the voluntary exercise by reducing the threshold for long-term potentiation in the DG., Further, exercise-induced neurogenesis was associated with the upregulation of VEGF, and BDNF,,, levels. These results show more evidence of the importance of these growth factors in exercise-induced neurogenesis and that neurotrophic factors are linked to and control the microenvironments of specific neurogenic sites such as the subventricular zone (SVZ) and DG. Further, because the beforementioned growth factors are diffusible molecules, exercise-induced neurogenesis may affect other nonneurogenic brain areas. A recent study showed that exercise did affect neuronal activity in the posterior hypothalamic area (PHA), in such a way that the in vitro and in vivo spontaneous firing rates of PHA neurons in exercised rats decreased significantly in relation to the nonexercised rats. From this study, exercise-induced neurogenesis has been documented in the neurogenic areas and may also generate neurogenetic effects on other nonneurogenic brain areas. The positive relationship between exercise and neurogenesis suggests that amount of exercise would correlate to the presence of neurotrophic factors which lead to neurogenesis. Despite this information, most CNS diseased states severely limit mobility which demonstrates the need to examine the effect of a lack of exercise on neurogenesis and the correlating neurotrophic growth factors. The negative health issues associated with a lack of physical therapy are well documented and can lead to osteoporosis, obesity, and cardiovascular disease,,, but not in their relation to neurotrophic factors and neurogenesis. It is vital to perform further research to identify critical growth factors in exercise, especially in neurogenic areas, as therapeutic targets to combat the negative effects of immobility. Studies have shown a lack of exercise worsens behavioral deficiencies in brain diseased conditions., Through this, one can develop procedural situations to avoid further brain degradation and help to improve the recovery from a brain injury by identifying specific parameters surrounding physical inactivity. To outline the effect of a lack of exercise we can set two specific parameters: neurotrophic factors and stress proteins. Our hypothesis is two-fold and states that the lack of exercise causes a downregulation of neurotrophic factors and an upregulation of stress proteins which both lead to suppressed neurogenesis. The HS model does limit exercise and leads to chronic stress. Chronic stress is shown to decrease serotonin levels and increase glucocorticoids.,, In addition, aging also increases glucocorticoids and reduces insulin-like growth factor-1 (IGF-1) levels. Together, stress and aging reduce levels of neurogenesis which shows that IGF-1 might play a vital role in neurogenesis. In addition to IGF-1, BDNF, and serotonin affect neuronal plasticity in chronic depression and stress studies.,,, Through this information, investigating chronic stress which plays a significant role in the HS model will provide valuable information about how stress affects neurogenesis. Bedridden patients who receive physical rehabilitation show surprising neurological improvements and recent research indicates that this stems from exercise enhancing endogenous neurogenesis. Previously, we examined how limiting exercise affects neurogenesis in standard rat 2-week HS model. The HS model lifts the rats' tail, shifting their weight to the front of the rat. In addition, exercise and recovery time was examined in rats that were placed in normal caging post-HS. To examine the levels of proliferation, BrdU (50 mg/kg, IP) was administered every 8 h during the last 4 days of each model. Immunohistochemistry analysis resulted in significantly less BrdU/doublecortin (Dcx) double-positive cells in the SVZ and DG for the HS model. While exercise during the recovery period did improve muscular atrophy of the soleus muscle, the recovery periods did not help the HS-induced reduction of BrdU/Dcx-positive cells. Another experiment identical to the previous HS model was performed with an enzyme-linked immunosorbent assay (ELISA) of neurotrophic factors was completed on the brain tissue and collected. Further, ELISA assays of neurotrophic factors were also completed on plasma sample from all animals. The results showed that HS model significantly decreased BDNF levels in the hippocampus and the VEGF plasma levels. The diminished levels of neurogenesis can be linked to the reduction of neurotrophic factors due to the inhibition of exercise. Through the HS model in relation to CNS disorders, the effects of exercise on neurogenesis and its correlating growth factors is more clearly understood. Research has clearly indicated that the lack of physical exercise and therapy leads to many health problems such as osteoporosis, obesity, and cardiovascular diseases,, and the effect of neurotrophic factors and neurogenesis has yet to be studied in this aspect. Any limitations administered on a recovering individuals' environment can cause abnormal motor and cognitive functions even under healthy nonpathological situations. Further, if the recovering patient is diseased, the lack of exercise exacerbates the behavioral outcome., Despite many studies siting the beneficial outcomes of physical rehabilitation, a specific therapeutic procedure has not been identified and occasionally, it can have negative effects in some diseased animal models. For instance, 18 days of treadmill exercise presented no developments to motor and memory functions specifically involved in the increased levels of BDNF mRNA in the CA1 and CA3 but not in the DG. In addition to this evidence, when using a cast to rehabilitate the damaged limb after damage to the sensorimotor cortex exacerbated the animals condition and the coordinated movements between limbs. Despite this, other evidence proves that exercise enhances neuronal function in rodent brain disorder conditions, such as ischemia., Depending on several rehabilitation methods, such as the difficulty, length, and regularity, in addition to the severity of the injury or disorder of the animal, might cause the disparity in data and can lead to varying evidence in future research. The current typical exercise and recovery period spanning 2–4 weeks post-HS lead to the mass of the soleus muscle developing toward standard levels. Still, when HS-suppressed neurogenesis was eliminated the SVZ and DG did not show any advancement by the recovery period. These results suggest that more precise and efficient rehabilitation methods are needed. When addressing therapeutic methods for bedridden or physically inactive patients, our study offers important insights on specific neurotrophic factors, such as BDNF and VEGF, which directly affect neurogenesis. The reversed paradigm of increasing exercise to improve neurogenesis was tested to determine the negative effects of inhibiting exercise. For the first time, by utilizing HS for a CNS model and explicitly investigating the neurotrophic factors and stress protein levels, we can identify a possible source of diminished neurogenesis due to the lack of exercise. In addition, this proposed study will lead toward a greater understanding of neurological disorders and injuries and their relation to physical inactivity [Figure 1] and will provide new research about neurogenetic function that is not well represented in enhanced environment or increased exercise models. Overall, preclinical research is needed to evaluate neurogenetic treatment in immobilized animals. Furthermore, more advanced biomarkers of stem cell development need to be established for growth factors and stress-related proteins to better analyze the expected effects of inhibiting exercise on neurogenesis. Reynolds BA, Weiss S. Generation of neurons and astrocytes from isolated cells of the adult mammalian central nervous system. Science 1992;255:1707-10. Nichols J, Zevnik B, Anastassiadis K, Niwa H, Klewe-Nebenius D, Chambers I, et al. Formation of pluripotent stem cells in the mammalian embryo depends on the POU transcription factor oct4. Cell 1998;95:379-91. Pan GJ, Chang ZY, Schöler HR, Pei D. Stem cell pluripotency and transcription factor oct4. Cell Res 2002;12:321-9. Haas S, Weidner N, Winkler J. Adult stem cell therapy in stroke. Curr Opin Neurol 2005;18:59-64. Picard-Riera N, Nait-Oumesmar B, Baron-Van Evercooren A. Endogenous adult neural stem cells: Limits and potential to repair the injured central nervous system. J Neurosci Res 2004;76:223-31. Yano A, Shingo T, Takeuchi A, Yasuhara T, Kobayashi K, Takahashi K, et al. Encapsulated vascular endothelial growth factor-secreting cell grafts have neuroprotective and angiogenic effects on focal cerebral ischemia. J Neurosurg 2005;103:104-14. Yasuhara T, Hara K, Maki M, Matsukawa N, Fujino H, Date I, et al. Lack of exercise, via hindlimb suspension, impedes endogenous neurogenesis. Neuroscience 2007;149:182-91. Yasuhara T, Matsukawa N, Yu G, Xu L, Mays RW, Kovach J, et al. Transplantation of cryopreserved human bone marrow-derived multipotent adult progenitor cells for neonatal hypoxic-ischemic injury: Targeting the hippocampus. Rev Neurosci 2006;17:215-25. Yasuhara T, Shingo T, Kobayashi K, Takeuchi A, Yano A, Muraoka K, et al. Neuroprotective effects of vascular endothelial growth factor (VEGF) upon dopaminergic neurons in a rat model of Parkinson's disease. Eur J Neurosci 2004;19:1494-504. Yasuhara T, Shingo T, Muraoka K, Kameda M, Agari T, Wen Ji Y, et al. Neurorescue effects of VEGF on a rat model of Parkinson's disease. Brain Res 2005;1053:10-8. Yasuhara T, Shingo T, Muraoka K, Kameda M, Agari T, Wenji Y, et al. Toxicity of semaphorin3A for dopaminergic neurons. Neurosci Lett 2005;382:61-5. Yasuhara T, Shingo T, Muraoka K, Kobayashi K, Takeuchi A, Yano A, et al. Early transplantation of an encapsulated glial cell line-derived neurotrophic factor-producing cell demonstrating strong neuroprotective effects in a rat model of Parkinson disease. J Neurosurg 2005;102:80-9. Yasuhara T, Shingo T, Muraoka K, wen Ji Y, Kameda M, Takeuchi A, et al. 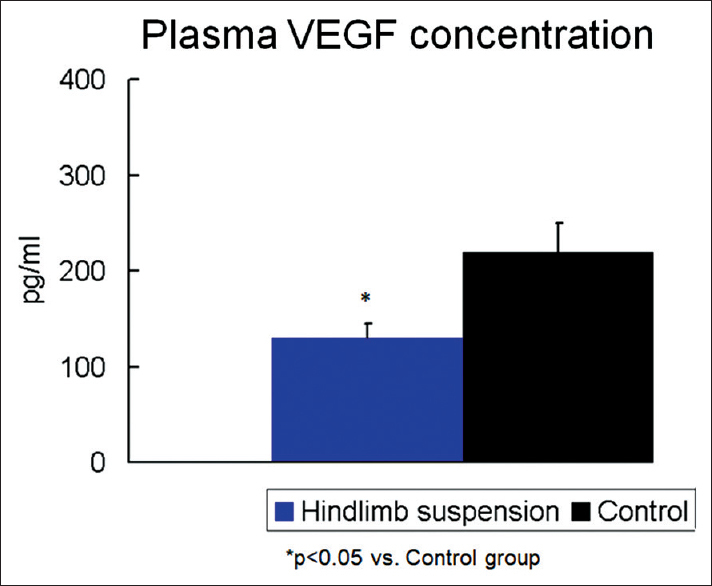 The differences between high and low-dose administration of VEGF to dopaminergic neurons of in vitro and in vivo Parkinson's disease model. Brain Res 2005;1038:1-0.
van Praag H, Kempermann G, Gage FH. Running increases cell proliferation and neurogenesis in the adult mouse dentate gyrus. Nat Neurosci 1999;2:266-70. Fabel K, Fabel K, Tam B, Kaufer D, Baiker A, Simmons N, et al. VEGF is necessary for exercise-induced adult hippocampal neurogenesis. Eur J Neurosci 2003;18:2803-12. Greisen MH, Altar CA, Bolwig TG, Whitehead R, Wörtwein G. Increased adult hippocampal brain-derived neurotrophic factor and normal levels of neurogenesis in maternal separation rats. J Neurosci Res 2005;79:772-8. Morey ER, Baylink DJ. Inhibition of bone formation during space flight. Science 1978;201:1138-41. Barou O, Palle S, Vico L, Alexandre C, Lafage-Proust MH. Hindlimb unloading in rat decreases preosteoblast proliferation assessed in vivo with brdu incorporation. Am J Physiol 1998;274:E108-14. Bodine SC, Latres E, Baumhueter S, Lai VK, Nunez L, Clarke BA, et al. Identification of ubiquitin ligases required for skeletal muscle atrophy. Science 2001;294:1704-8. Fujino H, Kohzuki H, Takeda I, Kiyooka T, Miyasaka T, Mohri S, et al. Regression of capillary network in atrophied soleus muscle induced by hindlimb unweighting. J Appl Physiol (1985) 2005;98:1407-13. Morey-Holton ER, Globus RK. Hindlimb unloading rodent model: Technical aspects. J Appl Physiol (1985) 2002;92:1367-77. Morey-Holton E, Globus RK, Kaplansky A, Durnova G. The hindlimb unloading rat model: Literature overview, technique update and comparison with space flight data. Adv Space Biol Med 2005;10:7-40. Picquet F, Falempin M. Compared effects of hindlimb unloading versus terrestrial deafferentation on muscular properties of the rat soleus. Exp Neurol 2003;182:186-94. Caldarone BJ, Harrist A, Cleary MA, Beech RD, King SL, Picciotto MR, et al. High-affinity nicotinic acetylcholine receptors are required for antidepressant effects of amitriptyline on behavior and hippocampal cell proliferation. Biol Psychiatry 2004;56:657-64. Cryan JF, Mombereau C, Vassout A. The tail suspension test as a model for assessing antidepressant activity: Review of pharmacological and genetic studies in mice. Neurosci Biobehav Rev 2005;29:571-625. Dupont E, Canu MH, Stevens L, Falempin M. Effects of a 14-day period of hindpaw sensory restriction on mRNA and protein levels of NGF and BDNF in the hindpaw primary somatosensory cortex. Brain Res Mol Brain Res 2005;133:78-86. Borlongan CV, Sanberg PR. Elevated body swing test: A new behavioral parameter for rats with 6-hydroxydopamine-induced hemiparkinsonism. J Neurosci 1995;15:5372-8. Borlongan CV, Skinner SJ, Geaney M, Vasconcellos AV, Elliott RB, Emerich DF, et al. Intracerebral transplantation of porcine choroid plexus provides structural and functional neuroprotection in a rodent model of stroke. Stroke 2004;35:2206-10. Borlongan CV, Skinner SJ, Geaney M, Vasconcellos AV, Elliott RB, Emerich DF, et al. Neuroprotection by encapsulated choroid plexus in a rodent model of Huntington's disease. Neuroreport 2004;15:2521-5. Borlongan CV, Stahl CE, Redei E, Wang Y. Prepro-thyrotropin-releasing hormone 178-199 exerts partial protection against cerebral ischemia in adult rats. Neuroreport 1999;10:3501-5. Bland ST, Pillai RN, Aronowski J, Grotta JC, Schallert T. Early overuse and disuse of the affected forelimb after moderately severe intraluminal suture occlusion of the middle cerebral artery in rats. Behav Brain Res 2001;126:33-41. Humm JL, Kozlowski DA, James DC, Gotts JE, Schallert T. Use-dependent exacerbation of brain damage occurs during an early post-lesion vulnerable period. Brain Res 1998;783:286-92. Schallert T, Jones TA. “Exuberant” neuronal growth after brain damage in adult rats: The essential role of behavioral experience. J Neural Transplant Plast 1993;4:193-8. Tillerson JL, Cohen AD, Philhower J, Miller GW, Zigmond MJ, Schallert T, et al. Forced limb-use effects on the behavioral and neurochemical effects of 6-hydroxydopamine. J Neurosci 2001;21:4427-35. Cohen AD, Tillerson JL, Smith AD, Schallert T, Zigmond MJ. Neuroprotective effects of prior limb use in 6-hydroxydopamine-treated rats: Possible role of GDNF. J Neurochem 2003;85:299-305. Baldauf K, Reymann KG. Influence of EGF/bFGF treatment on proliferation, early neurogenesis and infarct volume after transient focal ischemia. Brain Res 2005;1056:158-67. Katsuragi S, Ikeda T, Date I, Shingo T, Yasuhara T, Ikenoue T, et al. Grafting of glial cell line-derived neurotrophic factor secreting cells for hypoxic-ischemic encephalopathy in neonatal rats. Am J Obstet Gynecol 2005;192:1137-45. Katsuragi S, Ikeda T, Date I, Shingo T, Yasuhara T, Mishima K, et al. Implantation of encapsulated glial cell line-derived neurotrophic factor-secreting cells prevents long-lasting learning impairment following neonatal hypoxic-ischemic brain insult in rats. Am J Obstet Gynecol 2005;192:1028-37.
van Praag H, Christie BR, Sejnowski TJ, Gage FH. Running enhances neurogenesis, learning, and long-term potentiation in mice. Proc Natl Acad Sci U S A 1999;96:13427-31. Holmes MM, Galea LA, Mistlberger RE, Kempermann G. Adult hippocampal neurogenesis and voluntary running activity: Circadian and dose-dependent effects. J Neurosci Res 2004;76:216-22. Farmer J, Zhao X, van Praag H, Wodtke K, Gage FH, Christie BR, et al. Effects of voluntary exercise on synaptic plasticity and gene expression in the dentate gyrus of adult male sprague-dawley rats in vivo. Neuroscience 2004;124:71-9. Sun Y, Jin K, Xie L, Childs J, Mao XO, Logvinova A, et al. VEGF-induced neuroprotection, neurogenesis, and angiogenesis after focal cerebral ischemia. J Clin Invest 2003;111:1843-51. Berchtold NC, Kesslak JP, Pike CJ, Adlard PA, Cotman CW. Estrogen and exercise interact to regulate brain-derived neurotrophic factor mRNA and protein expression in the hippocampus. Eur J Neurosci 2001;14:1992-2002. Kitamura T, Mishina M, Sugiyama H. Enhancement of neurogenesis by running wheel exercises is suppressed in mice lacking NMDA receptor epsilon 1 subunit. Neurosci Res 2003;47:55-63. Molteni R, Ying Z, Gómez-Pinilla F. Differential effects of acute and chronic exercise on plasticity-related genes in the rat hippocampus revealed by microarray. Eur J Neurosci 2002;16:1107-16. Beatty JA, Kramer JM, Plowey ED, Waldrop TG. Physical exercise decreases neuronal activity in the posterior hypothalamic area of spontaneously hypertensive rats. J Appl Physiol (1985) 2005;98:572-8. He J, Gu D, Wu X, Reynolds K, Duan X, Yao C, et al. Major causes of death among men and women in china. N Engl J Med 2005;353:1124-34. Mayhew PM, Thomas CD, Clement JG, Loveridge N, Beck TJ, Bonfield W, et al. Relation between age, femoral neck cortical stability, and hip fracture risk. Lancet 2005;366:129-35. Renehan AG, Howell A. Preventing cancer, cardiovascular disease, and diabetes. Lancet 2005;365:1449-51. Wallis C. The evolution wars. Time 2005;166:26-30, 32, 34-5. Lewis MH. Environmental complexity and central nervous system development and function. Ment Retard Dev Disabil Res Rev 2004;10:91-5. Will B, Galani R, Kelche C, Rosenzweig MR. Recovery from brain injury in animals: Relative efficacy of environmental enrichment, physical exercise or formal training (1990-2002). Prog Neurobiol 2004;72:167-82. Fitch RH, McGivern RF, Redei E, Schrott LM, Cowell PE, Denenberg VH, et al. Neonatal ovariectomy and pituitary-adrenal responsiveness in the adult rat. Acta Endocrinol (Copenh) 1992;126:44-8. Kawano S, Ohmori S, Kanda K, Ito T, Murata Y, Seo H, et al. Adrenocortical response to tail-suspension in young and old rats. Environ Med 1994;38:7-12. Tamashiro KL, Nguyen MM, Sakai RR. Social stress: From rodents to primates. Front Neuroendocrinol 2005;26:27-40. Anderson MF, Aberg MA, Nilsson M, Eriksson PS. Insulin-like growth factor-I and neurogenesis in the adult mammalian brain. Brain Res Dev Brain Res 2002;134:115-22. Karege F, Bondolfi G, Gervasoni N, Schwald M, Aubry JM, Bertschy G, et al. Low brain-derived neurotrophic factor (BDNF) levels in serum of depressed patients probably results from lowered platelet BDNF release unrelated to platelet reactivity. Biol Psychiatry 2005;57:1068-72. Mattson MP, Maudsley S, Martin B. BDNF and 5-HT: A dynamic duo in age-related neuronal plasticity and neurodegenerative disorders. Trends Neurosci 2004;27:589-94. Mattson MP, Maudsley S, Martin B. A neural signaling triumvirate that influences ageing and age-related disease: Insulin/IGF-1, BDNF and serotonin. Ageing Res Rev 2004;3:445-64. Stahl CE, Redei E, Wang Y, Borlongan CV. Behavioral, hormonal and histological stress markers of anxiety-separation in postnatal rats are reduced by prepro-thyrotropin-releasing hormone 178-199. Neurosci Lett 2002;321:85-9. Hicks RR, Boggs A, Leider D, Kraemer P, Brown R, Scheff SW, et al. Effects of exercise following lateral fluid percussion brain injury in rats. Restor Neurol Neurosci 1998;12:41-7. DeBow SB, Davies ML, Clarke HL, Colbourne F. Constraint-induced movement therapy and rehabilitation exercises lessen motor deficits and volume of brain injury after striatal hemorrhagic stroke in rats. Stroke 2003;34:1021-6. Van Meeteren NL, Eggers R, Lankhorst AJ, Gispen WH, Hamers FP. Locomotor recovery after spinal cord contusion injury in rats is improved by spontaneous exercise. J Neurotrauma 2003;20:1029-37.